A few weeks ago, I posted a critique of the alternate inflation measure devised by John Williams for his popular website ShadowStats.com. Several responders asked if I could also comment on Williams’ alternate unemployment rate. 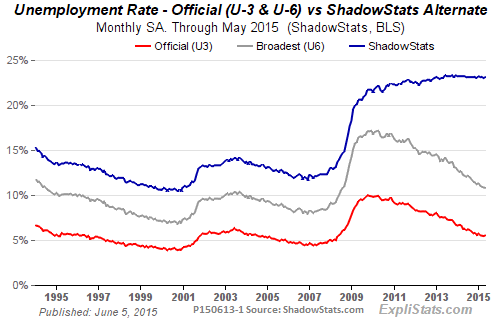 Here, reproduced with permission is the latest unemployment chart from ShadowStats. Like William’s inflation rate, his unemployment numbers run far higher than the official data from the Bureau of Labor Statistics (BLS). This post addresses two questions: First, what is the intended purpose of the ShadowStats alternate unemployment indicator? Second, given what it tries to do, is it calculated in a reasonable way? The standard unemployment rate from the BLS, known as U-3, focuses on a very narrow segment of the labor market. It tells us how many people are not working but who have actively looked for work in the past four weeks, expressed as a percentage of the civilian labor force. (The civilian labor force includes all people 16 years and older who are not in prison or the armed services. )The ratio of active job seekers to the labor force is highly sensitive to ups and downs in the business cycle. For that reason, monetary and fiscal policymakers watch it closely in deciding whether the economy needs stimulus or restraint. It is not perfect, but if what we want is a short-term business cycle indicator, it is probably good enough.